A thread dealing with identifying Gyromite game carts with Famicom import adapter. Once in a while the inside of the Gyromite game cart has Japanese Gyromite game PCB with a 60 pin to 72 pin U.S. NES adapter. A novelty but also a useful function. Idea is you can swap in any Japanese game PCB to work on your U.S. NES. External Famicom to NES adapters can be found online. One disadvantage of the external adapters is an extra plug connection; two "carts" that can wiggle causing a game freeze. At least going the Gyromite adapter approach, the Famicom PCB can be locked down with screws inside the large NES game cart case. Playing Famicom bootleg carts in your NES allow for discovering uncommon expensive out of print games and imports. Notable is playing the recalled game TENGEN TETRIS! Expensive in the original cart, but very common in most Famicom bootleg compilations. First off the an older post from Video Game Finds. Lot of good info from Ziggy and Hobie ! Ziggy587 wrote: Today, I got lucky, and now I finally have something to post about! I checked every copy of Gyromite they had, then all the 5 screw carts, then finally came across a Gyromite that was out of place which turned out to be the winner. Ziggy587 wrote: As far as I can tell, there are no outward differences. You CAN tell by the weight, but I wouldn't rely on that alone. It weighs just under an ounce more with the adapter inside. But you can tell by looking at the pins. Comparing the weight to another cart just confirms it. It's pretty hard to tell, but the printing of the purple on the label is a little different color too. I have 2 adapter Gyromite carts, but no normal one and I can't remember which type is more blue and which more purple. It's hard to tell though. Ziggy587 wrote: You're right. The ROB robot icon in the lower left corner is definitely a different shade of purple. I have two other copies that don't have adapters, so I just compared it. Still, I think the easiest way to identify it is by looking at the pins. Bwah Ha Ha Ha! Got mine today! NES Gyromite with adaptor for $4.99. Sales clerk at Luna Games very helpful, took time to find a good cart. Brought out the eight carts he had and compared weights. We both agreed that one of the carts did feel slightly heavier. Okay got the cart home and from the older post and research, here is what I found out so far. 1. Cart is slightly heavier, a scale will prove exact difference. 3.5 vs 4.5 ounces. 2. Cart balance also could be a factor, more balanced towards the center. 3. Gyromite contacts are individual unlike most other NES game carts. 4. Gyromites have five screws not three unlike most NES carts. 5. This particular cart has slotted screws not Game bit screws. 6. The R.O.B. color label too hard to tell even a close look, not a good indicator. All the carts at the store were purple, including my Import adaptor purple label cart. Dark Blue is supposed to be the adaptor version, not in this case though. Gamebit socket, not needed for Gyromite. For the balance method, put you Finger right on the back label on the word "CAUTION" at the underline. A regular cart will tip off. The Gyromite will stay balanced. Three screw cart, no adaptor in here! Stack Up Carts might have the import adaptor. Vintage Computing wrote: It’s not a myth if it’s true. Yes, Mario, there might be a Famicom to NES adapter in your copy of Gyromite. 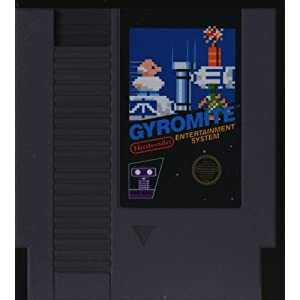 In fact, there might be an adapter in other early NES games, but so far, Gyromite is the only game cart I have personally found adapters in. Perhaps Stack-Up carts have the adaptor too? Balduin Wordpress wrote: Finally I got my Stack-Up NES cartridge from eBay. And yes, there’s almost 100% chance that in these cartridges are Famicom converters inside. When Nintendo released Stack-Up and Gyromite for America, they were in hurry to sell american systems, so they didn’t manufactered independently NES cartridges, and put these 60 to 72 pin converters inside the NES cartridges. Some other games had these converters too, but the chance to find one is smaller than in Stack-Up cartridges. Ziggy587 wrote: Take a look at the pins. You can see that the one with out the adapter has the little line dead center of each pin, while the one with the adapter has the little line to the side of each contact. From what I've read, and experienced, if you find a 5 screw NES cart and the lines on the contacts are NOT centered, then 100% of the time it has an adapter inside. This is not limited to just Gyromite carts, but any 5 screw cart that was a launch game. The very edge of the connector has the "points" on one side of each pin. This is the best way with a bright light and magnifying glass. Uncle Jenkins wrote: I just want to warn people that while there are other games besides Gyromite with adapters (I got mine in a copy of Pinball), they're strictly limited to the early Black Box titles. You might find a copy of a "silver box" game like Metroid or Kid Icarus that has 5 screws and off-center contacts, but it will NOT have an adapter. I found that out myself recently. Here is a comparison of the Silver and Black Label carts. I never noticed the background before on the five screw non hinged NES carts. Note the Metroid PCB at the right in the pic below. The contacts have the pins to one side just like a Nintendo Import Adaptor. The Metroid PCB has extra chips and is heavier then most NES carts. It is as heavy NES import adaptor game cart. Strange that there are two solder pads made for a CR2032 battery, perhaps the same PCB is used on other games. On the Metroid cart PCB, the end edge contact (at the bottom left of the pic below) has the pin point in the center of the edge of the contact. It is the little tip right on the end of the connector contact of the PCB. The Nintendo Import Adaptor has the pin point at one side on all the edges of the contacts. I just picked up another Gyromite Cart with an Import Adapter. One thing I noticed is the tips are hard to see when the cart edge is worn down or has dirty contacts. A magnifying glass helps, but then too obvious indicating a serious collector buyer. This might end up as a raise in prices, even if the seller is unaware of the Import Adapter. I confirmed that all non hinge cases with either the Import Adaptor inside or a newer NES game PCB are interchangeable. This can lead to confusion of what is inside if the original case has been traded to another case. The weighing or center of balance check is a guesstimate without a proper scale. At under an ounce difference, might be hard to spot. Some game titles have extra chips inside that sometimes throws this off. 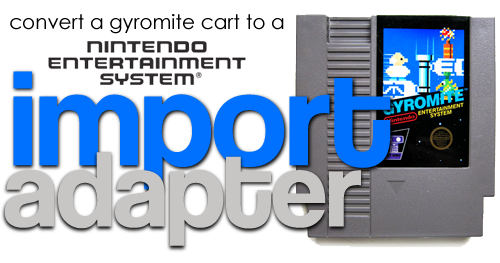 The Gyromite Import Adapter cart Label ROB Icon has a slightly darker blue color, but not always an accurate assessment. Both types of Gyromite carts have to be on hand to spot the difference. This does not always work, especially when some labels are more faded then others. Also the fact that cart cases can be swapped. I don't know why I never noticed this before, maybe because it is so small and easy to miss? Look at the Gyromite text, notice how both Gyromite carts have a blue TM Trademark logo? Now look at the Yellow Entertainment System text below the Gyromite title. The Import Adapter Cart has no yellow TM, the newer Gyromite game without the Import Adapter has the yellow TM logo! Not an absolute since there might be a chance of different labels, but a very solid indicator. If a Yellow "TM" logo then very likely no Import Adaptor inside. The Robot Icon color difference is hard to spot on the carts. Is it Blue or Purple or something between? The bottom left is a cart without an Import adaptor, it has a tiny yellow TM Logo. 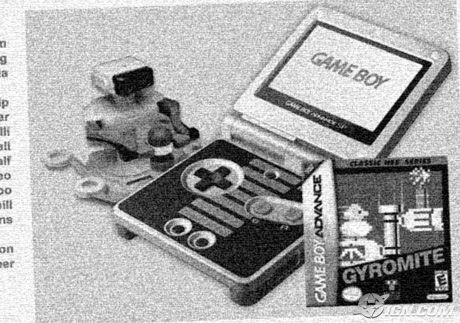 A purchased complete Gyromite Manual, Game Cart and Box. Interesting that the manual and box have a purple ROB icon while the cart with an Import Adapter inside is blue. All my Gyromite Import Adapter carts do not have a Yellow TM Logo. 1. Black background label indicates a Launch game cart, only some carts have the adapter. 2. All Launch games are five screw, but later ones are five screw or three screw hinged. 3. Gyromite carts with no Yellow TM logo on the label, a good sign of an Import Adaptor. 4. The best method for a confirm, ALL Contact Tips to one side, check first and last pins. Hobie-wan wrote: Here's the adapter I made from a Gyromite cart with a Famicom cart stuck in it. I finally get to try my R.O.B out, now have complete a complete NES set! Thanks to Corn619 for selling me the NES, and local Veterans Surplus store. Volleyball (1) (? a bit odd since Volleyball is a bit newer than rest and weren't exactly a must have title. Last edited by CRTGAMER on Tue Aug 29, 2017 12:09 am, edited 36 times in total. Pretty funny... I missed this thread when you posted it, but I just found it on a Google search! Easiest way to find a cart that has the converter inside: Looking at the contacts. You can make it out a little in the picture you have of the two Gyromite carts side by side. Gyromite carts withOUT the convert, and most (if not all) other NES games have a little line coming out of each contact. The line is dead center of each contact. Carts that have the converter inside, the little lines are to one side of each contact (and not in the center). Kinda hard to explain unless pointing it out in a picture (or in person). But as far as I'm concerned, it's the easiest and fastest way to tell. And you wont be a weirdo bringing a postal scale into the game store, or trying to balance it weird, or asking to open up all the Gyromite carts. Here's what I do. First, I identify a 5 screw cart. This is really easy to do because they don't have the hinges on the top of the cart. So most stores store the carts with the top label facing out, so it's easy to pick out the no hinged carts. So I'll take a look at each 5 screw cart and check the contacts. And if you stumble upon a 5 screw cart with the tell-tale sign of the contacts, you will probably also notice the extra weight to ultra confirm it. Ziggy587 wrote: Pretty funny... I missed this thread when you posted it, but I just found it on a Google search! Ah, some great pointers! Yeah, that postal scale would be extreme and arouse suspicion. I can see the difference right at the green above the contacts. A pen light instead can be explained away as just verifying the condition of the contacts. I'm gonna take a few pics to post here of the difference on the contacts. So take a look at the pins. You can see that the one with out the adapter has the little line dead center of each pin, while the one with the adapter has the little line to the side of each contact. Ziggy587 wrote: So take a look at the pins. You can see that the one with out the adapter has the little line dead center of each pin, while the one with the adapter has the little line to the side of each contact. Good info! The immediate difference I see is part of the wide shiny contact is covered with PCB green sealer on non-adaptor carts. The 5 screw Gyromite adaptor cart I found had regular phillips not gamebit screws. Are all 5 screw carts (even non adaptor carts) like this? Ziggy587 wrote: Here's what I do. First, I identify a 5 screw cart. This is really easy to do because they don't have the hinges on the top of the cart. So most stores store the carts with the top label facing out, so it's easy to pick out the no hinged carts. So I'll take a look at each 5 screw cart and check the contacts. And if you stumble upon a 5 screw cart with the tell-tale sign of the contacts, you will probably also notice the extra weight to ultra confirm it. I added a couple more pics showing how to spot the non hinge five screw adapter carts. Last edited by CRTGAMER on Thu Mar 17, 2011 1:29 pm, edited 2 times in total. CRTGAMER wrote: The 5 screw Gyromite adaptor cart I found had regular phillips not gamebit screws. No, I've come across plenty of 5 screw carts that had no adapter. I had a store let me open all of their carts up. Only got 1 Gyromite with adapter out of the lot. 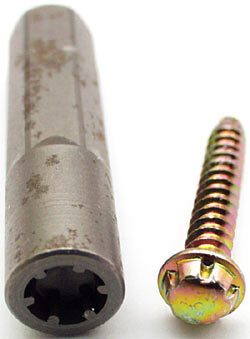 Nintendo switched to the 3 screw shells before they switched from the flathead with divot to the security screws. I know for certain my gold Zelda is 3 screw flathead, as is one that Sevin just picked up. I might have another cart like that but I can't remember right this second. LOL, that is the same technique that I use about 8 years ago when Funcoland sold NES games and Gyromites were $1. I probably looked through 20 to 30 Gyromites at different stores and yield only 3 with converters. Fun times back then. Didn't know about the purple color difference. Good to know. It's also possible to use the adapter without removing the PCB from your Famicom game carts.